Michelle Thompson is an Food from Thought research assistant and a Masters student in Plant Agriculture with Dr. Manish Raizada, studying beneficial endophytes in crops, and their role in protecting against pathogens. Michelle shares her personal perspective on the cohort experience and reflects on how the work has impacted her research program. My name is Michelle Thompson, and I am in the first semester of my Master’s program in Plant Agriculture. As a research assistant with Food from Thought, I am part of the sub-group focused on climate change and cropland. This research assistantship has been a very unique experience so far, in terms of the people we interact with, how we’re learning, and the style in which we are beginning our work. Working with students in entirely different disciplines is refreshing, fascinating, and eye-opening. We all bring different skills to the table. Without this collaboration I really would not have met these people, or realized quite how integral things like public health, philosophy, and water resources engineering are to agriculture and feeding people. We are learning a lot from each other, and were able to visit a variety of farms. 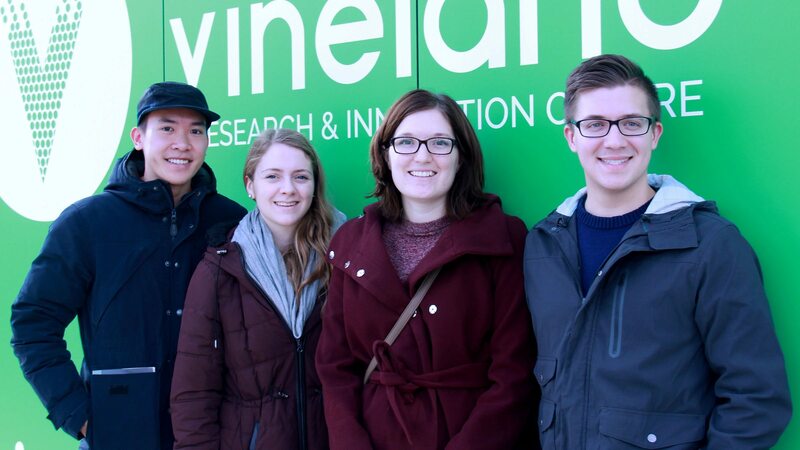 This was an interesting learning experience, as we all have some sort of exposure and experience in agriculture, but none of us have in-depth knowledge of all the agricultural industries in Ontario. There is a vast variety of agriculture happening in Ontario, and this program helps to innovativley link our individual sectors together. Although we are still in the early stages, we have been learning and working together in preliminary workshops. We are shaping a project that will serve an important need, while using each group member’s diverse skills. We have been meeting with community partners, and are eager to delve further into our work. Having a community partner is especially important for us to define our project, as we want our work to contribute to a real and imperative need, rather than a perceived need. Each of us are also working on our own graduate projects at this time. I have really been able to put my personal project (microbes in maize) into greater perspective after meeting with these peers and advisors, and the purpose I see in my independent work now holds a deeper meaning for the global food system. I am eager for the upcoming months!